A garden area of 22 hectares located on the southern and south-eastern slope of Petřín, it's separated from other Petřín gardens by the Hunger Wall, built by Charles IV. At first there were forests, and then vineyards in the Middle Ages. In the 1830s, the garden was modified in the English style. In the garden you'll find a wooden Greek-Catholic church of St. Michael and the Kinsky Summer Palace with a National Museum ethnographic exhibition. 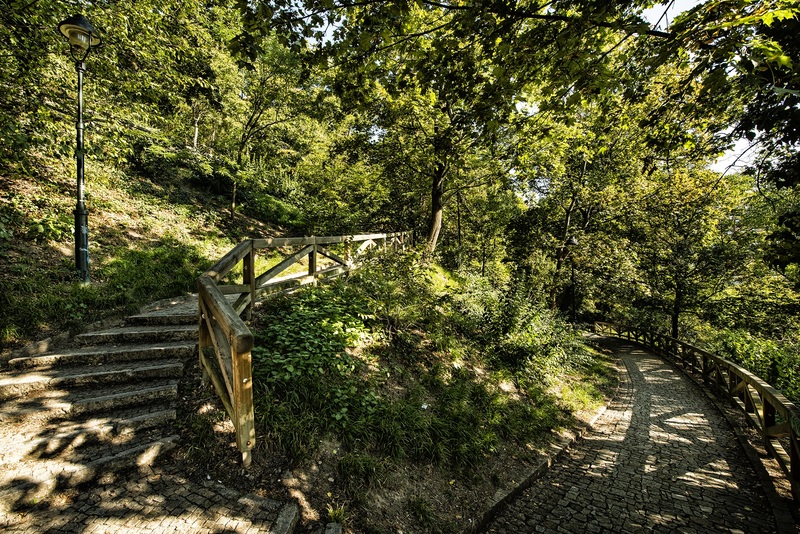 The garden with the area of almost 22 ha located on the southern and south-eastern slope of the hill of Petřín has been separated from other Petřín gardens by the Hunger Wall. The main entrance is from the Kinských square. Originally there were forests here followed by vineyards in the Middle Ages, mostly owned by the monastery. The name of the vineyard (Paradise or V kartouzích - by the Carthusian monastery) has been well known. Later settlements and courtyards were established there. After the Thirty Years war the place was desolate. In 1828 Růžena Kinská bought the lands and her son Rudolf Kinský founded the English-style garden here designed by his economic director František Höhnl. It was extended and modified in 1848 and again from 1860 to 1861 by the architect Bedřich Wünscher, who worked 62 years for Kinsky family. 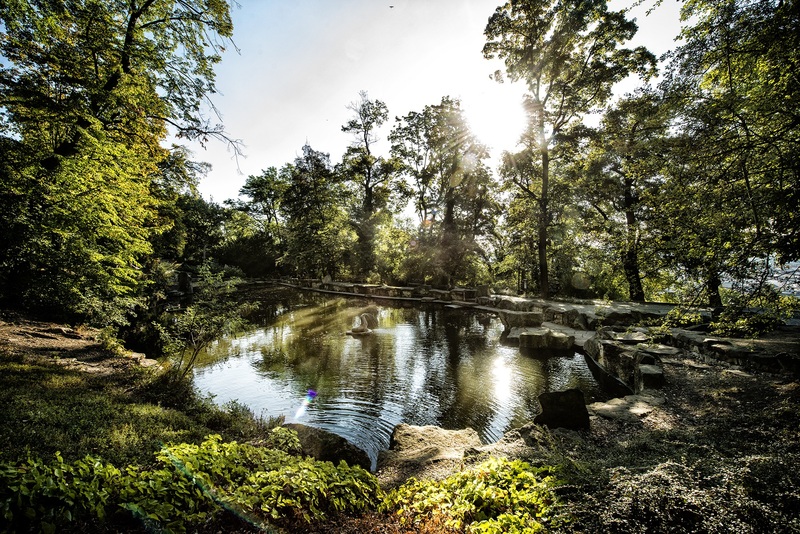 In 1831 the construction of the classical summerhouse by Viennese architect Heinrich Koch was completed, terrain modelling and planting were made and the 380 m long tunnel to the water source of two newly created ponds with a waterfall between them was driven. Also the carriage house called Švýcárna and ten greenhouses for tropical and subtropical plants were built. The building works in the garden were completed by the wife of Rudolf Kinsky, Wilhelmine, after his death due to his fall from a horse. At that time the garden was open for public twice a week, whereas tickets were sold in the Kinsky Palace. 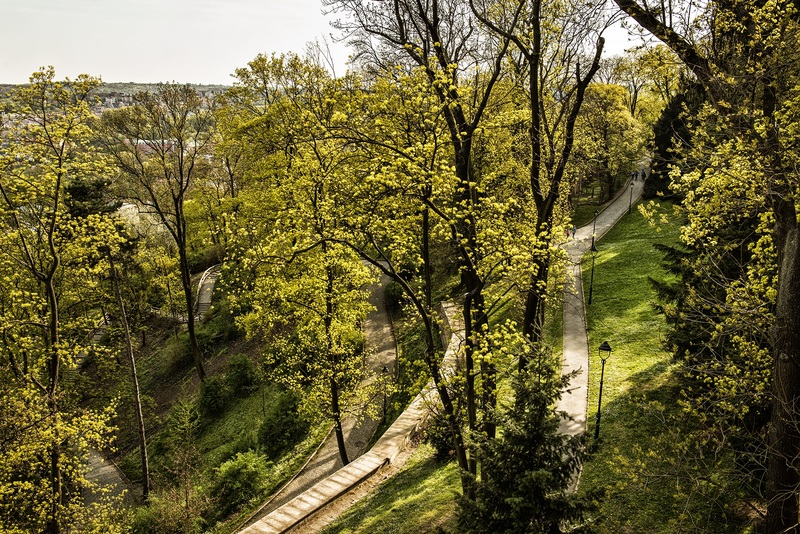 A descendant of the founders wanted to parcel out the garden and to sell lands for the construction of block of flats, which was prevented by the City of Prague, which bought the garden in 1901, opened it for the public in 1908 and re-cultivated it. The City of Prague lent the Kinsky Summerhouse to the Ethnographic Czechoslavic Society for the exhibits from the large Ethnographic Exhibition, held in Prague in 1895; in this way the Ethnographic Museum, open to the public in 1903 was established (see the separate document Kinsky Summerhouse).The garden was intended to be turned into a spectacular "ethnographic park", but ultimately it only became a location of some of the exhibits. One example is a wooden belfry from Dolní Bojanovice near Hodonín and Baroque monument from the 18th century. – a calvary with pyramid sundial and artistic decoration in the form of the plague column. The spear in the belly of Christ and the arrow in the body of St. Sebastian served for dropping shadow on the clock dial. Originally the column stood in Žižkov reportedly at the place of today’s St. Prokop church commemorating the plague epidemic. 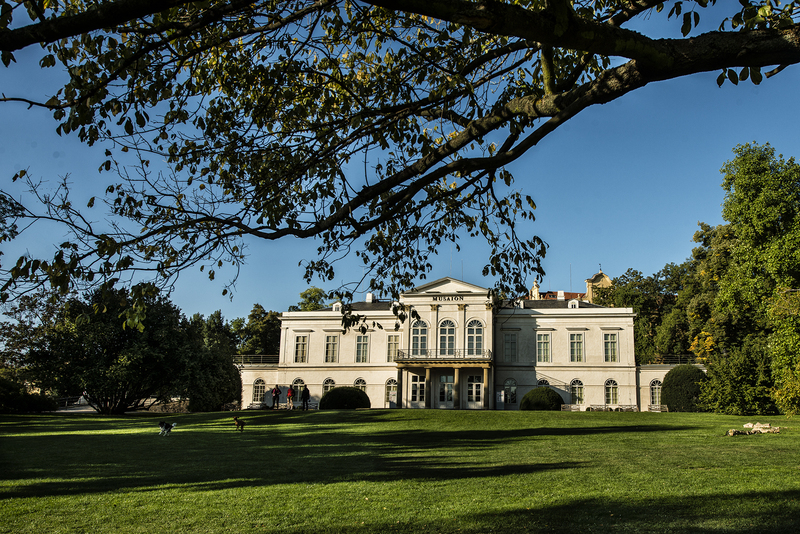 In the lower part of the garden an exhibition pavilion of SVÚ Mánes used to be, which was later demolished; in 1902 the famous exhibition of works by French sculptor Auguste Rodin and several others was held there. Also the statue by Karel Dvořák called The Fourteen Year Old Girl created in 1926 was there. Today it is placed in the depository in the Museum of the Capital City of Prague. Near the summerhouse was on the occasion of the seventh anniversary of the death of actress Hana Kvapilová placed her statue by Jan Štursa from 1913, under which there is the urn with her ashes. As of the tenth anniversary of Carpathian Ruthenia becoming part of Czechoslovakia the wooden Greek-Catholic church of St. Michael from 1750 was moved here from Medvedovce near Mukachevo. In 1939 the Baroque statue of Hercules from the late 17th century was moved to the lower lake over the summerhouse from Kampa, the seal sculpture by sculptor Jan Lauda from 1953 was placed to the upper lake. At the end of March 2010 the long gradual reconstruction was completed.